Famous for its martinis - a favourite with James Bond author Ian Fleming - Dukes Hotel extends its drinking area to include an outdoor Cognac and Cigar Garden. Open all year round, from 8pm until midnight, the garden must be one of the most sophisticated place you can enjoy an al fresco cigar and a nightcap in London. The picturesque setting - with lantern lighting and modern decking - can accommodate up to 20 guests who can choose from the range of cognacs displayed in the hand crafted wooden brandy cabinet. They've even created a martini cocktail specially for the garden - the fruity 'Ruby Windsor' made with champagne, angostura bitters, cognac and a brown sugar cube. Trust Dukes to come up with such a stylish way to shun the smoking ban. Dukes Hotel: Cognac and Cigar Garden clubs, bars, cabaret nights, casinos and interesting nightlife. What are the best dining options near Dukes Hotel: Cognac and Cigar Garden London? Dukes Hotel: Cognac and Cigar Garden gyms, sporting activities, health & beauty and fitness. 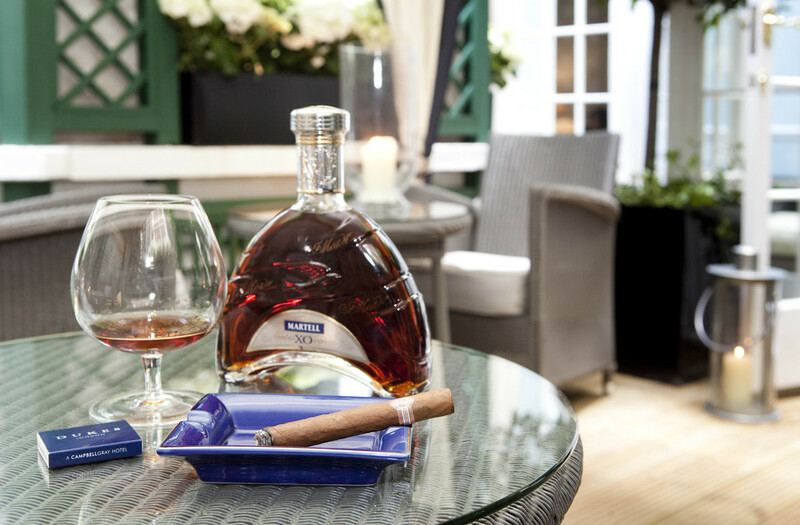 The best pubs near London Dukes Hotel: Cognac and Cigar Garden. Where to have your meeting, conference, exhibition, private dining or training course near Dukes Hotel: Cognac and Cigar Garden. From cheap budget hotels to luxury 5 star suites see our special offers for Dukes Hotel: Cognac and Cigar Garden hotels, including The Stafford London Hotel from 96% off.